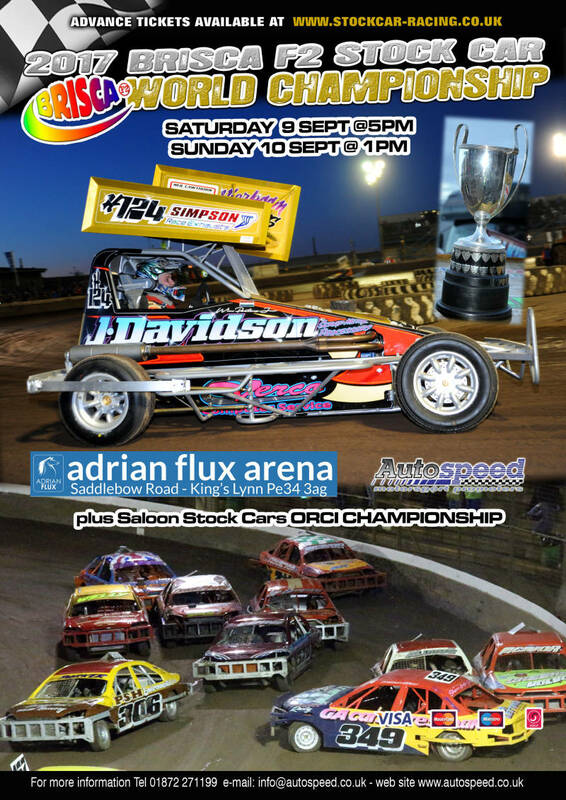 This year’s BriSCA F2 Stock Car World Championship will be staged by Autospeed at the Adrian Flux Arena, Kings Lynn. For the first time ever, two Scottish drivers have qualified for the front row. National Points Champion 7 Gordon Moodie will start on pole position, as he seeks to add to his World title victory from 2006. Outside him will be British Champion 16 Craig Wallace, whose father Jimmy won back to back World titles in 1988 and 1989. However, behind Moodie sits one of his arch rivals, 854 Robbie Dawson; the two having clashed when they last raced one another at Kings Lynn in Semi Final 1 last year. Equally as intriguing, F2 Nationals Champion 38 Dave Polley is sat directly behind Wallace; and those two stars have recently been involved in a war of words. The front two rows are explosive, and row three will have two very quick international competitors. At 3.00pm on Saturday, the 11 overseas entrants will contest their time trials sessions, to determine their positions on the grid. Amongst the group of overseas drivers will be reigning World Champion H124 Wim Peeters, and reigning World of Shale Champion H47 Patrick Tersteeg. After the Opening Ceremony, there will be a Grand Parade of non-World Finalists, and then straight on to racing at 5.00pm. The F2 World Final is Race 6 on the programme. In all, just over 100 BriSCA F2 Stock Cars are expected in action. The event also includes the ORC Championship for Saloon Stock Cars; and there are more than 50 of them on the entry list, including drivers from Northern Ireland, Scotland and mainland Europe. Another full day of racing is scheduled for Sunday 10 September, with Double Trouble for the Saloon Stock Cars, and this year’s staging of the Duncan & Margaret Farrington Trophy for the F2s.